Summer's been a musical blast so far. About a month ago I got to experience Tom Waits live at his show in Atlanta's stunning Fox Theatre (you can listen to the entire 2.5 hour show here thanks to NPR; you can actually hear me - I'm the one screaming, clapping, and singing along). It was my second live Waits show, the first being the Asheville, NC stop of his Orphans tour in 2006. Seeing Waits live was a life goal I had written off until two years ago; that I've been able to experience him perform over five hours of live material I consider a true blessing (and now I know where my lost luggage ends up, thanks Tom). More recently, I returned from a family gathering in Pigeon Forge, TN. On the way we passed through Gatlinburg where I got to meet Mark Edelman at Smoky Mountain Dulcimers. 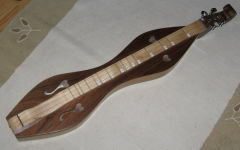 I'd never played an mountain lap dulcimer before, but I can play a lot of guitar and a little banjo so I was a quick study. If you don't know, they have four strings - three tuned to A and one to D - and they're fretted to the major scale starting at the 5th. Two of the A-tuned strings are positioned close together, like the strings on a 12-string guitar; they're used for the melody. The other two strings (AD) serve as harmony. The effect is something like the chanter and drones on a bagpipe. Once you get the physical aspects of playing the instrument down, getting it to make music is pretty easy and a lot of fun. I liked them enough to pick one up - the traditional hourglass beauty you can see in the picture for this post. It's as much for my girls as myself. I think it will be a great way to expose them to stringed instruments. In fact - and this is no lie - I've got my 3-year-old strumming out "Twinkle Twinkle Little Star" and "You are my Sunshine" while I help her little hand hold the noter down!